Travis Michael Head is an Australian Cricketer who has emerged as a reliable middle order batsman in the limited overs format. He was born on 29th December 1993. He is a left-handed batsman and also has the ability to bowl right arm off break. Head is a part of the Adelaide Strikers in the BBL. He has also been a regular feature of the South Australia domestic side. He was also an integral member of the U 19 World Cup Australian side in 2012. Head has also the distinction of being the youngest captain for the Redbacks. He has also played for the Royal Challengers Bangalore side in the IPL and has also played for the English County side Yorkshire. Head has played 65 matches in his career till now and has scored 2,165 runs at an average of 37.32. He has taken 16 scalps at an average of 59.37. Travis Head is touted to be a capable and fine middle-order batsman in the limited overs format, who has also the ability to bowl some effective off breaks. Hailing from Adelaide, where he had played at the underage levels for the Craigmore Cricket Club. Head has represented South Australia at both under-17 and under-19 level. Head made his first-class cricket debut for his home state South Australia in the Sheffield Shield at the age of 18 in early 2012. He made a promising start to his where he scored his maiden half-century in his second match and falling short of scoring his maiden century in his third match with 90 runs against the Tasmanian side. His consistent performances were well rewarded as he earned a rookie contract with South Australia. Head's form was rewarded by national selectors when he was included in Australia's squad T20 series against a formidable Indian side. He made his international debut during the series at his home ground, the iconic Adelaide Oval. Consistency again earned Head a maiden call-up to the Australian ODI squad for the first time against the West Indies. He finally made his ODI debut on 13 June 2016. Head’s leadership quality came to the fore as he led South Australia to their first Sheffield Shield final in 20 years and was named the Sheffield Shield Player of the Year, as he scored 699 runs at an average of 38.83 before the final, in which his side lost. In the limited over’s format, Head has started to become a vital cog in the Australian side. He has donned multiple roles with the bat mostly batting in the middle order slot, providing solidity to the side. He also opened the innings in early 2017 as a part of an experiment by the management. His debut as an opener saw him reaching to his first century and also being involved in a historical opening stand with David Warner. In the early part of Head's career, he struggled to reach his maiden first-class century, instead finishing with scores in the nineties on multiple occasions during the 2013-14 Sheffield Season. Head did not impress the selectors during the 2017-18 Sheffield season, as the only scoring totals of 8 and 0, but he strongly bounced back with an impressive knock against Victoria and a century against Queensland. Due to his inconsistent performance in the Sheffield Shield season, he did not earn selection in Australia's Test team. Head had been a talked about name in the Australian domestic circuit. An elegant stroke maker who also has incredible power in his shots. He has been over the years been a vital cog for the Redbacks. 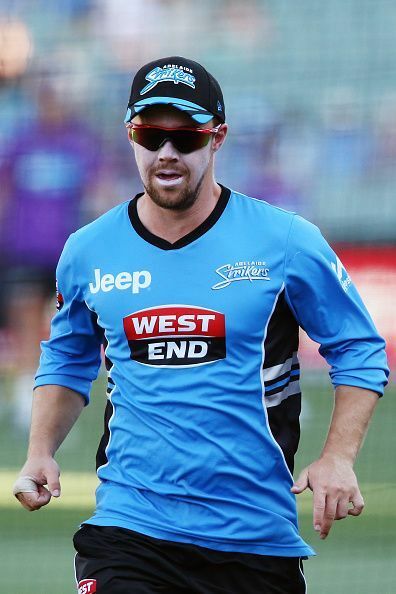 Head is also an important part of the Adelaide Strikers in the BBL. He has also played county cricket for Yorkshire. He has been a part of the Bangalore franchise in the IPL. In February 2015 Head was named as the Captain to replace Johan Botha as the captain of South Australia. As the captain his fortunes continued took a turn for good during the 2015–16 season as he showed his class in all three formats of the game. When Brad Hodge left the Adelaide Strikers, Head replaced him as the team's captain in the BBL.